For many, it’s been a tough week to be British, but with the arrival of Wimbledon fortnight, some semblance of peace and order can be found in the tennis enclave of SW19 with its carefully manicured grass courts, tinkle of ice in Pimm’s and, of course, the pristine white attire the All England club still insists is worn by all players. The rule, which upholds Wimbledon’s strong sense of tradition and is one of the things to set it apart from the other grand slam competitions, had its origins in the early days of the game in the nineteenth century when the visibility of sweat, especially on women players, was considered unseemly. White not only disguised this, but gave the impression of freshness, and a century and a half on, the unshakeable rule remains. She also prescribed thin-soled white ‘gymnasium shoes’, choosing white cotton over heavier, coloured flannel or ‘stuff’ due to its infinitely washable properties and avoiding the wearing of hats. A decade later, the girl who beat Mrs Lambert Chambers in a gruelling 3-set match to take the Wimbledon title in 1919, would revolutionise tennis fashion. Frenchwoman Suzanne Lenglen presciently brought the youth and vivacity of the 1920s to the tennis court, sporting a succession of lightweight garments; chemise style dresses with pleated skirts, loose, straight cardigans and short-sleeved blouses or V-necked vests (still considered a risqué neckline). Lenglen’s outfits were designed by Jean Patou, the French couturier who pioneered sportswear as fashion and championed the ‘garconne’ look, opening a dedicated sportswear department in his couture store in 1925 and subsequently opening further branches in fashionable resorts such as Deauville and Biarritz. Lenglen’s clothes were embroidered with Patou’s signature, a visible declaration of the creative and commercial bond between designer and sports person and one that remains an essential relationship in the sportswear industry today. Patou was to continue as the go-to designer for a leisured lifestyle; in 1927, dialling in to the new trend for tanning with the launch of the first suntan oil, Huile de Chaldee in 1927 and a fragrance called, quite simply, ‘Sport’ the following year. Lenglen meanwhile, who topped off her on-court attire with a white fur coat (below, second from left), was hailed as a fashion revolutionary. London department store, Selfridges drafted her in to design a range of tennis clothes for them in 1933 (below left). Elizabeth Ryan, a contemporary of Lenglen and holder of 19 doubles titles at Wimbledon, said of her, “All women players should go on their knees in thankfulness to Suzanne for delivering them from the tyranny of corsets.” Ryan had witnessed the drying rack in the dressing rooms at Wimbledon where blood stained corsets were hung. Tennis, perhaps because of the high profile of women players, continued to be a showcase for the development of sporting style. When the Spanish player Lili D’Alvarez wore a divided skirt designed by Elsa Schiaparelli at Wimbledon in 1931, (above, second from right) the garment caused a sensation, causing many magazines to note how it also ‘divided opinion’. The actress Gladys Cooper appeared in The Illustrated Sporting & Dramatic News in June the same year (above right), ‘trouser-skirted’ in an outfit she was planning to wear to Lady Cranfield’s tennis party at West Hall. Around the same time, some daring ladies began to wear shorts to play in, including one Mrs G. E. Tomblin, spotted in a 1932 issue of The Sketch wearing them while at a club in Chiswick (below, second from left), though the same magazine asked in one fashion column in March that year, ‘Can shorts rival these graceful frocks for the courts?’ (below, second from right). 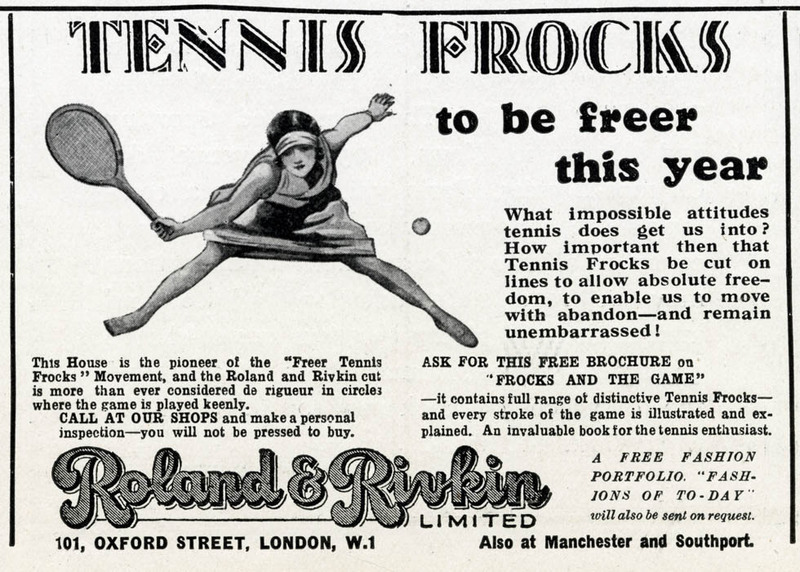 It’s an unsurprising viewpoint considering Aristoc were still advertising silk stockings suitable for the tennis court in 1933 (below right). It would be the pioneering American Alice Marble who was the first to wear them at Wimbledon in 1937 (below left). By the 1950s another big personality was beginning to dominate the tennis fashion scene with his wildly feminine styles. 6 ‘ 7” Cuthbert Collingwood “Ted” Tinling (1910-1990) was an English tennis player and referee, already firmly doing the social round by the early 1930s. Suffering from respiratory problems, he had been sent to the French Riviera as a teenager and began to play tennis on the courts of the Cannes, eventually becoming Lenglen’s referee. 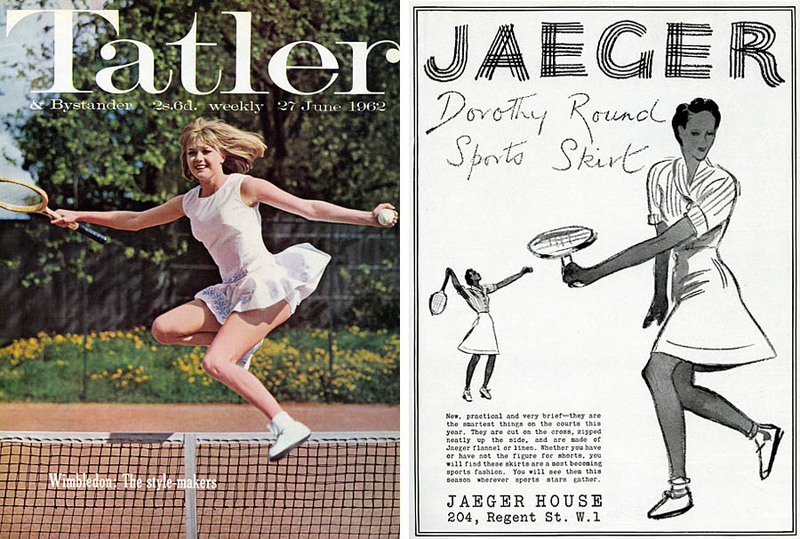 We discovered a photograph of him from this time with Lord Charles Hope on the courts there in a 1931 volume of The Tatler (below left). Tinling’s playful, fashionable, flirty designs were worn by the majority of major tennis stars in the 1950s, 60s and 70s, from Billie Jean King to Martina Navratilova, but he is probably best known for the notorious frilly knickers worn by Gussie Moran in 1949, the scandal of which led to him being dismissed from his position as player liaison at Wimbledon (he would be welcomed back in 1982). Within our archive, there are some fabulous sixties designs by him featured in the swinging, ‘London Life’ magazine (three pictures below). Despite the forays of tennis stars such as Serena Williams into the 21st century world of sportswear design, female tennis fashion today feels more serious and functional than the glory days of Tinling, though thankfully, the styles of over a century ago are consigned to the club’s excellent museum. 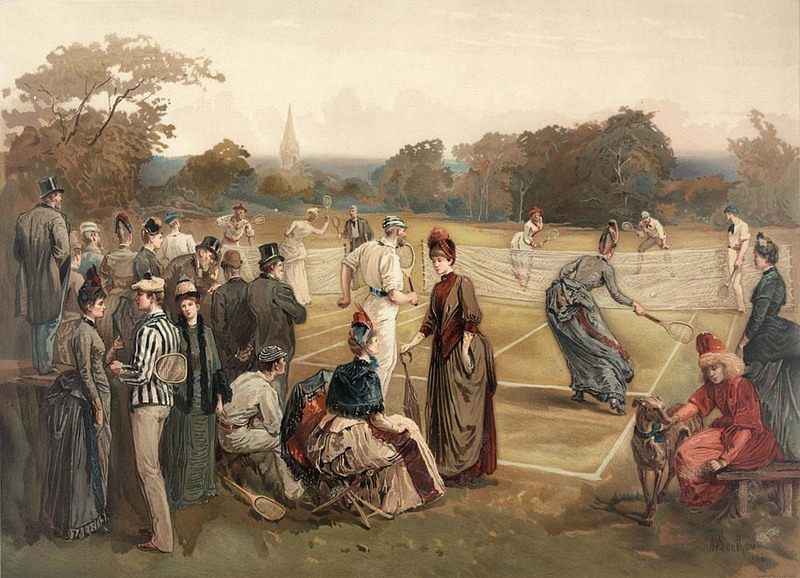 How interesting it would be to see modern-day tennis players try to play in the corsets and long skirts of May Sutton, Lottie Dod and Dorothea Lambert Chambers. One wonders, when the mercury rises on Centre court, could they endure a three-setter in the searing heat? Adapted from an excerpt taken from ‘Retro Fashion’ by Lucinda Gosling, published by New Holland. Click here to see a wider range of tennis fashion images.